The 350 engine small block is what started it all for Chevy. The General Motors design in the early 1950s has produced many of the engine blocks in the past 60 years. The V8 is now standard in most Chevy vehicles that require more horsepower. 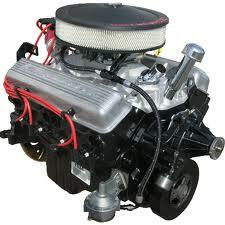 You can find reliable power and a great price in our 350 Chevy crate engine inventory. Everyone loves a good price. We sell to owners of Chevy cars, trucks, SUVs or other vehicles. We even provide crate motors for project vehicle owners. Whatever your passion, we provide the solution for uninterrupted power. What is a rebuilt crate engine? These are most of what is found in the current inventory. A special process of engine tear down and assembly is used for these motors. Each part is hand inspected after engines are disassembled. Old parts are switched for new ones during each build. A comprehensive cleaning process is what can make a block like new. GM crate engines coming from our inventory give a near showroom finish. Rebuilding 350 V8 blocks is just one of our specialties. Working hard at customer service is another. L48, L65, LM1, ZQ3, L46, LT1, L82, L81, L83, L98, L05 and L31. These sizes represent most of the production from the 1950s to 2005. You’ll never worry about inventory shortages here. The builds that are in our inventory are protected by our warranty. We provide 36 months of coverage. This means that our team does a great job building blocks. We protect the block, parts and mileage that is placed onto them. Our team works hard to make customers happy. Each V8 build is identical to GM OEM specs. Can you find the quote form on this page? This is what you’ll use to get your individual quote. The methods used here for price delivery are simple to understand. You input your data into our collection form. It is submitted to our staff. We immediately begin the matching process. We search our system. We ensure a match is found. We double check our inventory. We do everything that is required before we send your quote to you. There are no worries here. Start using our quote form right now. You can call us toll-free and we’ll answer questions.